How long does it take to get the product? We can get some items in few days. For the most part, the timeline ranges from one to 10 weeks, depending on your product and stock needs. We have sales consultants who can help meet your needs, on budget – based on the product line, fabrics and finishes you want. How many lines do you carry? We carry thousands of lines from hundreds of manufacturers. Click here for a list of the manufacturers we use. What items or products do you carry in-stock? We customize products to each client’s needs and order accordingly. We don’t carry one-size-fits-all stock. Can I see a layout or 3D image? Absolutely! We have trained interior designers on staff, and we offer block plans, space utilization techniques, 2D layouts, and 3D layouts. Which contracts do we offer? We offer many contracts including Texmas, E&I, TCPN, TPASS, US Communities, MED, MASS, Premier, Broadlane, and HPG to name a few. Please contact us if you have questions regarding a specific contract. Some of our products come assembled, and some do not. It depends on your individual selection. Do you offer delivery or installation? Is there an additional cost? We offer services based on your needs. Pricing is determined based on a consultation with a member of our design or sales teams. Do you offer rental furniture? Absolutely! Please contact us for the options. We offer many options: leasing programs, credit cards (MC or Visa) or checks. Other credit options are available based on credit qualifications. Does your furniture have a warranty? Yes, all products have a warranty. Specifics are dependent on the product line or manufacture warranty. 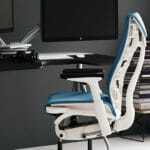 Herman Miller has an unmatched warranty in the industry offering a 12-year warranty on all parts and labor.